Three weeks ago, I went shopping at Lil’ Lambs Closet, a consignment sale at our church. 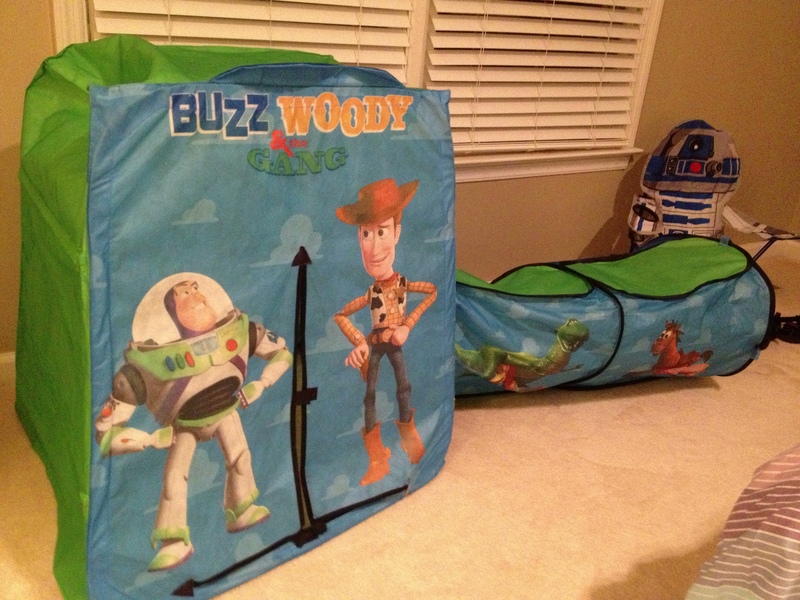 As a last-minute purchase, I grabbed a Toy Story tent. It was $10, and I figured Robbie would have fun with it for at least a day or two. He has spent every night except for one in the tent for the past three weeks. And where is this lovely tent? In our bedroom of course, allowing for all sorts of fun family time. 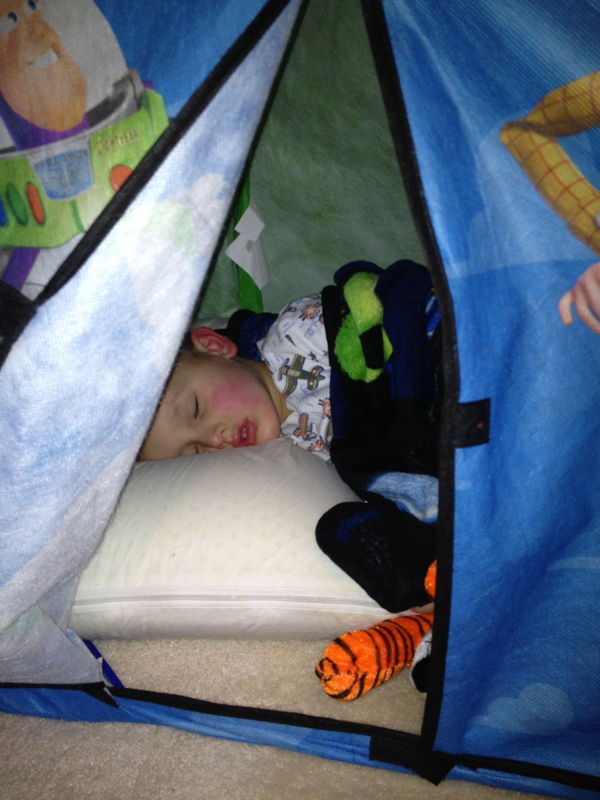 Robbie goes into his tent to play with his cars, to read books, to watch videos, to sleep. 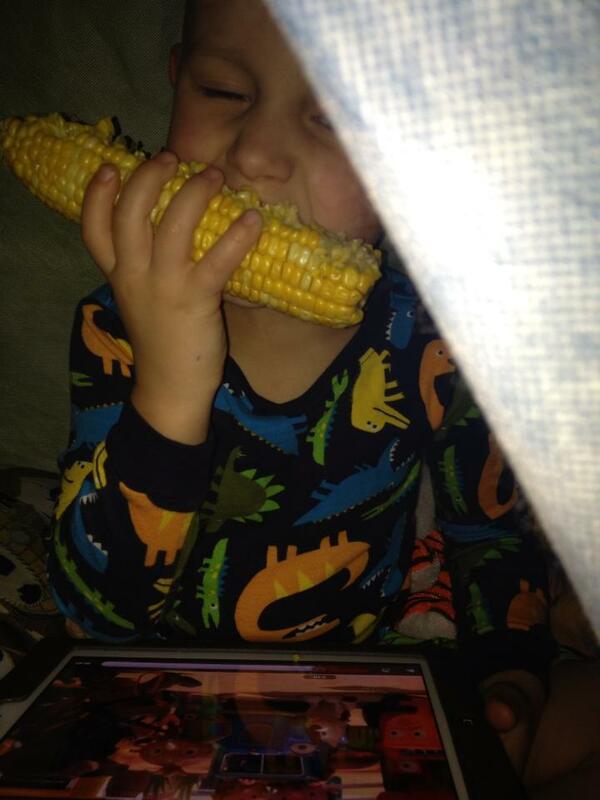 And to eat corn. Over the weekend, Justin and I ate a late dinner outside while Robbie was supposed to be going to sleep. 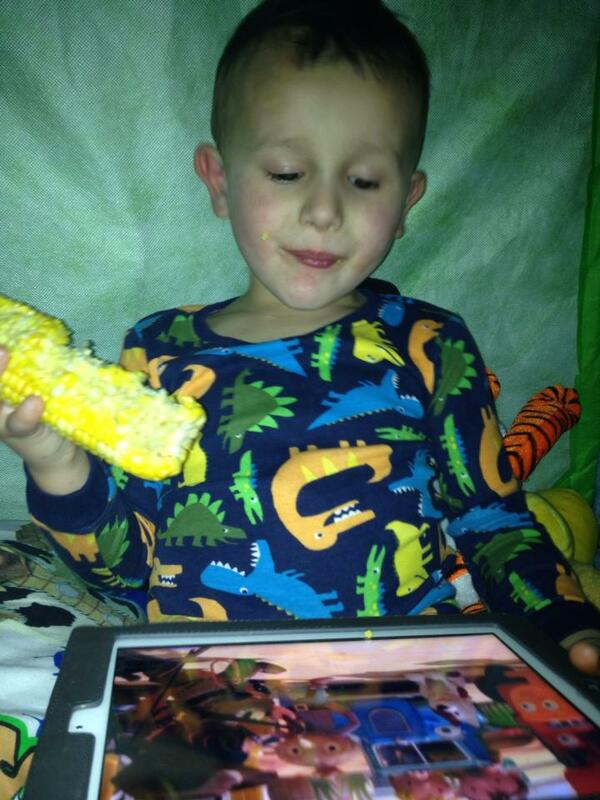 I came in to check on my cherub to find him watching a video and eating an ear of corn. Tonight, I went in to check on he-who-does-not-want-a-bedtime and was informed that he wanted to sleep in the dining room. Confused, I gathered everything that Robbie handed me (a great deal fits in this three-square-feet tent). This shot is early on in the tent phase. We were a little concerned Hoarders might do an episode on pre-schoolers. He has a little of everything, including copies of 48 Laws of Power and A Thousand Splendid Suns and the lid to an urn. There also may or may not be a banana peel or two under all of this. 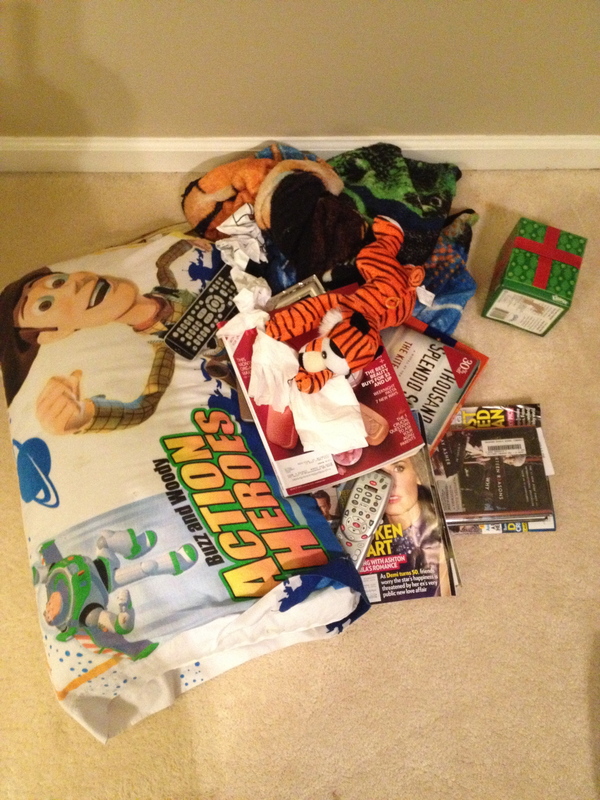 His Toy Story pillow and blanket, big Mickey, small Mickey, Pluto, and the tent. Robbie grabbed a stuffed tiger, a stuffed rabbit, and his cup of hot water (not quite sure what that’s all about). And off we went. Except Robbie doesn’t actually know what a dining room is. He stopped in the living room, insisting that was where he wanted to sleep. Conveniently, it is also where Justin and I were watching this debacle of a basketball game. I’m not sure how, but, despite all the yelling at the TV, he appears to have fallen asleep. Is it hard to have so little time without Robbie in a three-foot radius? Yeah, a little. But I also know he’s not going to sleep in his tent forever (after all, his feet already stick out the side flap). And I know we’re probably only a few years from him not even wanting me to go into his bedroom, much less camp out on my floor. So I’ll take this, even though I’m not actually allowed in the tent because I’m a girl – and some standards just can’t be compromised.